Dr. Kevin Langford, associate professor of biology and pre-health professions program director at Stephen F. Austin State University, will be the interviewer during the 2018 Archie McDonald Speaker Series. NACOGDOCHES, Texas - Dr. Kevin Langford, associate professor of biology and pre-health professions program director at Stephen F. Austin State University, will be the interviewer during the 2018 Archie McDonald Speaker Series. The speaker series event is free and scheduled for 7:30 p.m. Monday, April 23, in the Baker Pattillo Student Center Grand Ballroom on the SFA campus. Langford will interview guest speaker Dr. Jennifer Arnold, medical director for the Simulation Center at Johns Hopkins All Children's Hospital in St. Petersburg, Florida, and television personality on The Learning Channel's docu-drama "The Little Couple." A native of East Texas and third-generation graduate of SFA, Langford earned his bachelor's and master's degrees in biology from SFA. 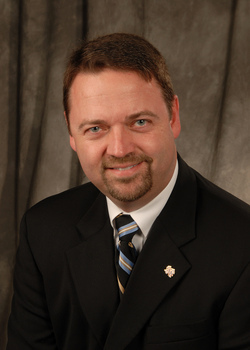 Following completion of his doctoral research at the Medical College of Wisconsin in Milwaukee, Langford spent the next seven years at the Arkansas Cancer Research Center in Little Rock. He joined the SFA biology faculty in fall 2002. "I am pleased to have this opportunity to interview Dr. Arnold," Langford said. "She is a highly sought after speaker who is well-known in the medical community for her vast expertise in simulation education. I look forward to interviewing her and learning more about her career and family." Langford accepted the role of pre-health professions program director at SFA in 2006, and he has served in that capacity for the past 12 years, assisting students in achieving their dream of becoming doctors, dentists and other health care professionals. He also is the Joint Admissions Medical Program faculty director, a position that allows Langford to assist economically disadvantaged students in reaching their goal of becoming doctors. Langford maintains active research in the areas of cellular and molecular events that direct cardiac development in the embryo. He has published papers on the development of healthy blood vessels and is now working on understanding events during heart development that may one day help reduce the risk or eventually eliminate heart defects in newborns. SFA's Student Government Association sponsors the speaker series, which is open to the public. Passes may be obtained at the Involvement Center on the first floor of the Baker Pattillo Student Center on the SFA campus or the Nacogdoches Convention and Visitors Bureau, located at 200 East Main St.
A private reception for 100 guests will be held prior to the main event. Private reception tickets can be purchased by contacting April Smith, SFA associate director of development, at (936) 468-5406.